Topography is the study of the shape and features of land surfaces. 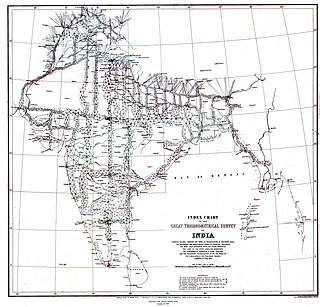 The topography of an area could refer to the surface shapes and features themselves, or a description. A theodolite is a precision optical instrument for measuring angles between designated visible points in the horizontal and vertical planes. The traditional use has been for land surveying, but they are also used extensively for building and infrastructure construction, and some specialized applications such as meteorology and rocket launching. An inclinometer or clinometer is an instrument used for measuring angles of slope, elevation, or depression of an object with respect to gravity's direction. It is also known as a tilt indicator, tilt sensor, tilt meter, slope alert, slope gauge, gradient meter, gradiometer, level gauge, level meter, declinometer, and pitch & roll indicator. Clinometers measure both inclines and declines using three different units of measure: degrees, percent, and topo. Astrolabes are inclinometers that were used for navigation and locating astronomical objects from ancient times to the Renaissance. 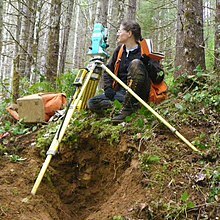 Levelling or leveling ; is a branch of surveying, the object of which is to establish or verify or measure the height of specified points relative to a datum. It is widely used in cartography to measure geodetic height, and in construction to measure height differences of construction artifacts. The Ramsden surveying instruments are those constructed by Jesse Ramsden and used in high precision geodetic surveys carried out in the period 1784 to 1853. This includes the five great theodolites—great in name, great in size and great in accuracy—used in surveys of Britain and other parts of the world. Ramsden also provided the equipment used in the measurement of the many base lines of these surveys and also the zenith telescope used in latitude determinations. A geodetic control network is a network, often of triangles, which are measured precisely by techniques of terrestrial surveying or by satellite geodesy. A level is an optical instrument used to establish or verify points in the same horizontal plane in a process known as levelling, and is used in conjunction with a levelling staff to establish the relative heights levels of objects or marks. It is widely used in surveying and construction to measure height differences and to transfer, measure, and set heights of known objects or marks. Stadiametric rangefinding, Tacheometry, or the stadia method is a technique of measuring distances with a telescopic instrument. The term stadia comes from a Greek unit of length Stadion which was the typical length of a sports stadium of the time. Stadiametric rangefinding is used for surveying and in the telescopic sights of firearms, artillery pieces, or tank guns, as well as some binoculars and other optics. It is still widely used in long-range military sniping, but in many professional applications it is being replaced with microwave, infrared, or laser rangefinding methods. Although much easier to use, electronic rangefinders can give away the shooter's position to a well-equipped adversary, and the need for accurate range estimation existed for much longer than electronic rangefinders small and rugged enough to be suitable for military use. A cave survey is a map of all or part of a cave system, which may be produced to meet differing standards of accuracy depending on the cave conditions and equipment available underground. Cave surveying and cartography, i.e. the creation of an accurate, detailed map, is one of the most common technical activities undertaken within a cave and is a fundamental part of speleology. Surveys can be used to compare caves to each other by length, depth and volume, may reveal clues on speleogenesis, provide a spatial reference for other areas of scientific study and assist visitors with route-finding. 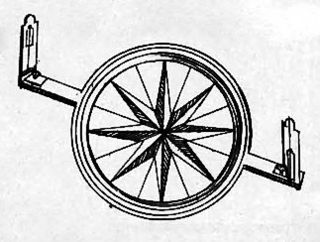 A circumferentor, or surveyor's compass, is an instrument used in surveying to measure horizontal angles. It was superseded by the theodolite in the early 19th century.